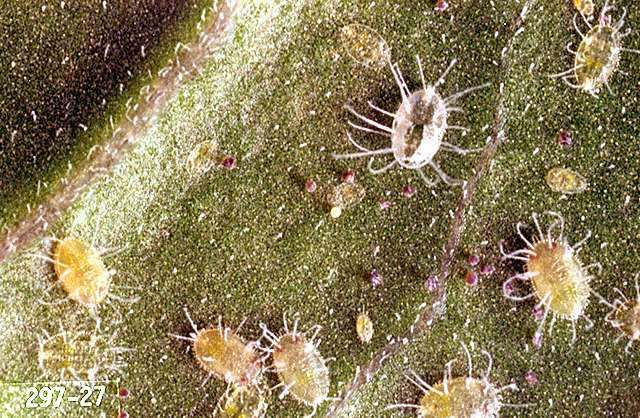 Inspect new plants before purchase: infestations often are introduced. Encourage natural enemies such as ladybird beetles, spiders, and parasitic wasps. 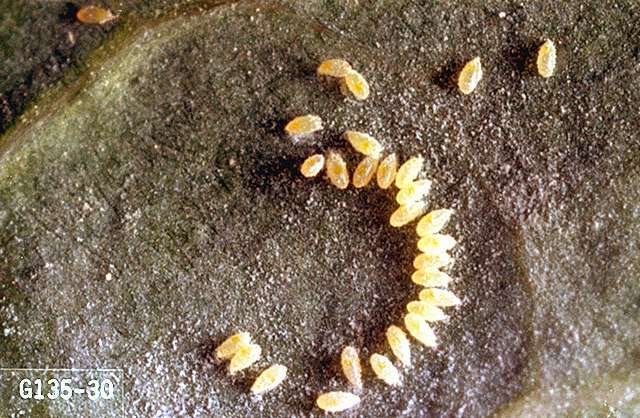 Avoid use of broad-spectrum insecticides which reduce populations of these. Spray at 7-day intervals, several times if necessary. For best results, direct spray toward undersides of leaves. Read label application instructions carefully. Beauvaria bassiana-Some formulations are OMRI-listed for organic use. plant-derived essential oils (rosemary, peppermint etc. )-Some formulations are OMRI-listed for organic use. acetamiprid (Assail 30SG) at 0.047 to 0.075 lb ai/a. PHI 7 days. REI 12 hr. Retreatment interval 7 days. Do not exceed 0.3 lb ai/a per season. Limit four applications per season. beta-cyfluthrin/imidacloprid (Leverage 360) at 0.096 lb ai/a. PHI 7 days. REI 12 hr. Retreatment interval 7 days. Do not exceed 0.12 lb ai/a beta-cyfluthrin or 0.24 lb ai/a imidacloprid per season. bifenthrin (Brigade WSB) at 0.033 to 0.08 lb ai/a. PHI 7 days. REI 12 hr. Do not exceed 0.2 lb ai/a per year. Retreatment interval 7 days. bifenthrin/imidacloprid (Brigadier) at 0.08 to 0.15 lb ai/a. PHI 7 days. REI 12 hr. Do not exceed 0.24 lb ai/a imidacloprid and 0.2 lb ai/a bifenthrin. Retreatment interval 7 days. bifenthrin/zeta-cypermethrin (Hero) at 0.1 lb ai/a. PHI 7 days. REI 12 hr. Retreatment interval 7 days. Do not exceed 0.266 lb ai/a per season. Chenopodium ambrosioides extract (Requiem 25EC) at 4 to 6 pints formulated product per acre. REI 4 hr. OMRI-listed for organic use. chlorantraniliprole /thiamethoxam (Voliam Flexi) at 0.1 to 0.175 lb ai/a. PHI 1 day. REI 12 hr. Minimum of 5 days between applications. Do not exceed 0.172 lb ai of thiamethoxam or 0.2 lb ai of chlorantraniliprole per acre per growing season. Chromobacterium subtsugae (Grandevo) at 0.3 to 0.9 lb ai/a per 100 gal. PHI 0 days. REI 4 hr. OMRI-listed for organic us. cyantraniliprole (Verimark) at 0.088 to 0.176 lb ai/a at planting, drip chemigation or soil injection. PHI 1 day. REI 4 hr. Do not exceed 0.176 lb ai/a at planting or 2 drip chemigation or soil injections. Do not exceed 0.4 lb ai/a per season. cyfluthrin/imidacloprid (Leverage 2.7) at 0.11 lb ai/a. PHI 7 days. REI 12 hr. Retreatment interval 7 days. Do not exceed 0.17 lb ai/a cyfluthrin or 0.24 lb ai/a imidacloprid per year. cyclaniliprole (Harvanta 50SL) at 0.036 to 0.054 lb ai/a. PHI 1 day. REI 4 hr. Limit 3 treatments. Do not exceed 0.22 lb ai/a per year. Retreatment interval 5 days. dinotefuran (Scorpion 35SL) at 0.05 to 0.18 lb ai/a foliar or 0.23 to 0.27 lb ai/a for soil. PHI 1 day foliar, or 21 days for soil. REI 12 hr. Do not exceed 0.266 lb ai/a foliar or 0.532 lb ai/a soil per season. flonicamid (Beleaf 50SG) at 0.089 to 0.133 lb ai/a. PHI 0 days. REI 12 hr. Do not exceed 0.267 lb ai/a or three applications per season. Retreatment interval 7 days. 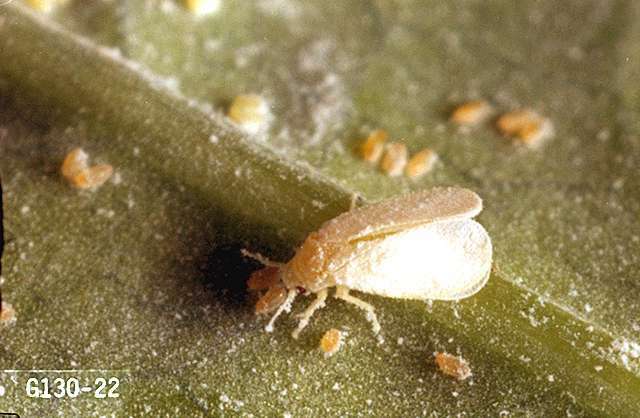 Suppresses greenhouse whiteflies. flupyradifurone (Sivanto 200SL) at 0.14 to 0.18 lb ai/a foliar; 0.27 to 0.37 lb ai/a soil. PHI 1 day foliar; 45 days soil. REI 4 hr. Retreatment interval 7 days. Do not exceed 0.365 lb ai/a per season. imidacloprid (Admire Pro) at 0.25 to 0.38 lb ai/a soil, 0.0156 lb ai/10,000 plant in greenhouse and 0.047 to 0.079 lb ai/a foliar. PHI 0 days foliar; 21 days soil. REI 12 hr. Do not exceed 0.24 lb ai/a foliar or 0.38 lb ai/a soil per season. Limit 1 application greenhouse. Foliar retreatment interval 5 days. imidacloprid (Provado, Prey) at 0.048 lb ai/a. PHI 0 days. REI 12 hr. Retreatment interval 5 days. Do not exceed 0.24 lb ai/a per season. novaluron (Rimon) at 0.078 lb ai/a. PHI 1 day. REI 12 hr. Do not exceed 0.233 lb ai/a per season. Retreatment interval 7 days. pymetrozine (Fulfill) at 0.086 ai/a. PHI 0 days. REI 12 hr. Retreatment interval 7 days. Do not exceed 0.172 lb ai/a per season. pyriproxyfen (Knack) at 0.054 to 0.067 lb ai/a. PHI 1 day. REI 12 hr. Do not exceed 0.109 lb ai/a per season. Retreatment interval 14 days. 30 day plant back restriction. spirotetramat (Movento) at 0.06 to 0.08 lb ai/a. PHI 1 day. REI 24 hr. Retreatment interval 7 days. Do not exceed 0.16 lb ai/a per crop season. sulfoxaflor (Closer SC) at 0.066 to 0.07 lb ai/a. PHI 1 day. REI 12 hr. Retreatment interval 7 days. Do not exceed 0.266 lb ai/a per year. thiamethoxam /chlorantraniliprole (Durivo) at 0.195 to 0.257 lb ai/a. PHI 30 days. REI 12 hr. Do not exceed 0.172 lb ai of thiamethoxam or 0.2 lb ai of chlorantraniliprole per acre per growing season. thiamethoxam (Actara) at 0.047 to 0.086 lb ai/a. PHI 0 days. REI 12 hr. Retreatment interval 5 days. Do not exceed 0.172 lb ai/a per season. thiamethoxam (Platinum) at 0.078 to 0.172 lb ai/a soil treatment. PHI 30 days. REI 12 hr. Do not exceed 0.172 lb ai/a per season. spiromesifen (Oberon 2SC) at 0.11 to 0.13 lb ai/a. PHI 1 day. REI 12 hr. Do not exceed 0.4 lb ai/a per season. Retreatment interval 7 days. Limit 3 treatments per season.